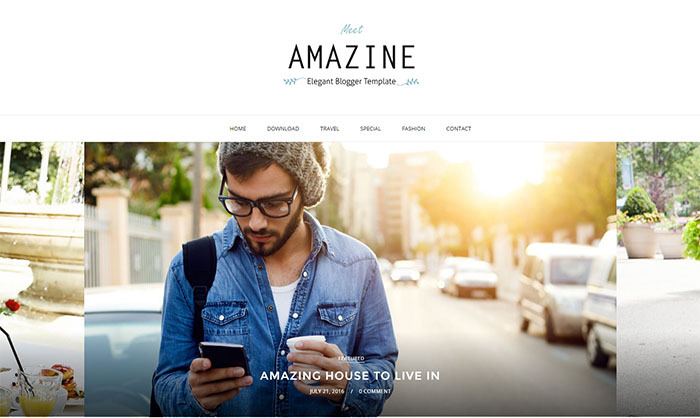 Amazine Blogger Template is a perfect clean and elegant Blog theme to satisfy all your blogging needs for bloggers, designers, photographers, Fashion Bloggers and others who needs a customizable, responsive and modern type blog Theme. Like our previous multipurpose blogger template blush You have several options to choose for your Blog layout. In this blogger template we have also incorporated 2 Blog styles. It has Features that you won’t find in any blogger template. Like with this blogger template you can easily customize anything in the template, without changing a single piece of code. It boasts with several amazing features and allows you to effortlessly customize anything up to any level, you can change font styles, color change, background color change, sidebar customization setting footer customization setting.